As I've told you, I've settled for my scent some years ago and I am still a firm believer of remaining faithful to ones perfume as I like the idea of associating people with certain scents. Smells are in fact extremely important for me to the point where I could fall in and out of love with someone simply on account of how they smell. I'm dead serious. Somehow, my sense of smell seems to be the most developed of all my senses and therefore prone to overrule the others. 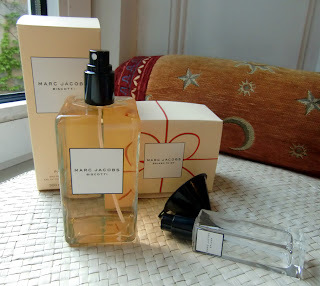 Last week I accompanied MC on her quest for a new perfume and came across "Biscotti" from Marc Jacobs's limited edition "Patisserie"series (the other two are "Apple" and "Pomegranate"). Although it is a tiny bit sweeter than the fragrances I usually go for, it is still citrusy enough to appeal to my senses. After testing it again on Saturday with Chiquita, who likewise thought it smelled good and contemplated purchasing it, I couldn't get it out of my mind and returned to the shop in my lunch-break today. I'm not sure if it will be only a summer fling what with the humongous 300 ml (!) size of the bottle- the only size available. What finally sold me was the fact that it comes with a separate handbag-sized bottle and a little funnel. I also really love the plain Chanel-esque design: Besides, the name perfectly goes with my current cookie-phase.